With the madness in the house being the weekend before Christmas, I retreated to the man cave for some one on one time with the voices in my head. Having completed my first knife grind a week or so ago, I decided to have another go at something different. I wanted to do a special 'salami cutter' in a mini clever format with a super thin slicing blade, and also wanted to try a hidden tang design. I started with the salami cutter first using a piece of O1 steel. Ended up over grinding the plunge line with too causer grit grinding belt, so I broke new territory and turned it into a 'single bevel salami cutter'. It came out ok. The single bevel flat grind is a completely different beast to sharpen, and the edge is not clever flat, but it does cut salami well. The spots on the blade are where I didn't clean the quench oil off properly before tempering. According to the experts, with O1, you need to commence tempering before the blade cools to below 60 deg, so cleaning the canola oil off the blade properly was a low priority at the time (lesson learnt). The tempering definitely 'seasoned' the oil onto the blade. It would polish out, but I kind of like the leopard spots and it will bled into the natural patina over time. 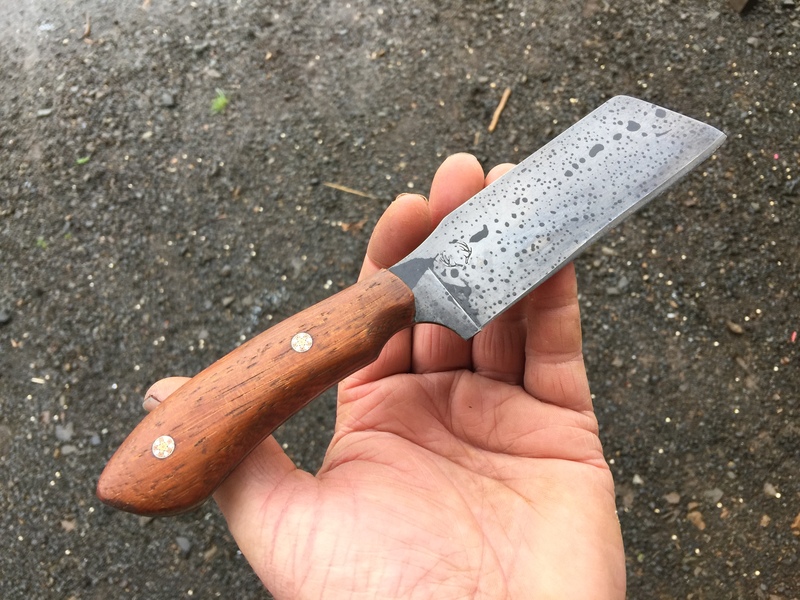 The hidden tang was inspired by a Damascus knife I liked on the net. 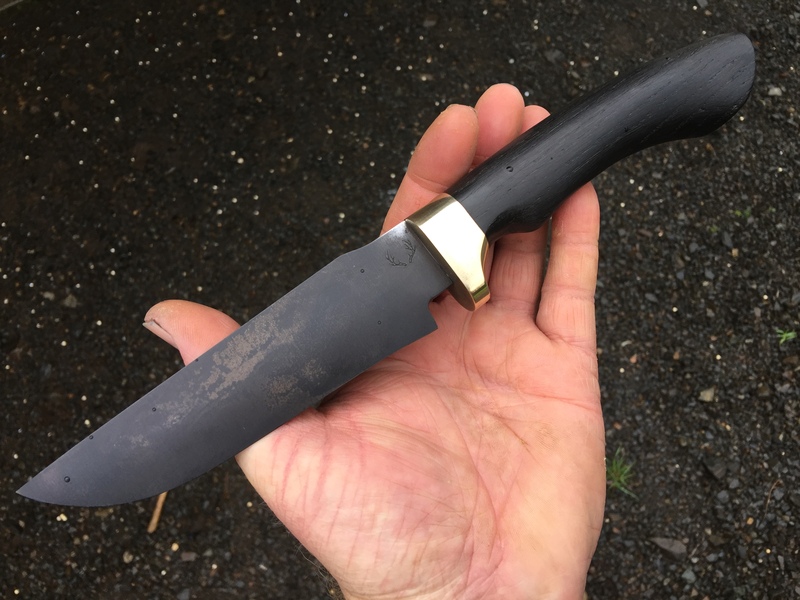 Its 1075 steel with a Russian swamp/bog black wood of some description that I got cheap off Etsy. Convex grind (yet to be sharpened) and surface finish untouched from heat treat. Last edited by hotbarrels; 24-12-2018 at 10:07 AM. Tahr, keenbloke, short swede and 4 others like this. Nice job on the Salami cutter. I have a Chinese mini cleaver with a very very thin blade and a hollow grind - slice a roast, prep vege, split a pumpkin, cut and serve a slice of cake. Will do for pizza too, at a pinch.